Due to the angle at which the photograph was taken, this wasn’t the easiest print to identify. However, some of you got it right – it is in fact a hyena print; Steve and the group were even lucky enough to see one that day sprinting past them. Of all the comments, Zoe was the first to answer correctly, winning a £10.00 Woodlore Voucher. If you’d like to brush up on your skills at tracking and identifying wildlife, we’d recommend taking a look at the Animal Tracks & Signs book or, even better, taking part in our Woodlore Tracking course. This entry was posted in Competitions on November 18, 2010 by Woodlore Team. Following on from the previous posting, a very generous offer by Ray !…I think the track was made by the front paw of a Leopard. from Ethiopia and Kenya to Tanzania and Mozambique. P. l. nubica. i think this is a leopard track. Wow! quite a number of tracks there overlapping each other. Well it’s a big mammalian predator, a female with young I presume. It’s hard for me with no experience. My first instincts were a big cat, but it’s hard on the photo to get any sense of scale. The small track upper right side seems to have 3 lobes and says cat to me. Though the big obvious print centre right and below centre left could perhaps be hyena but I can’t distinguish any claw marks. I could be repeating the theme of ray’s generous gift to children in need. 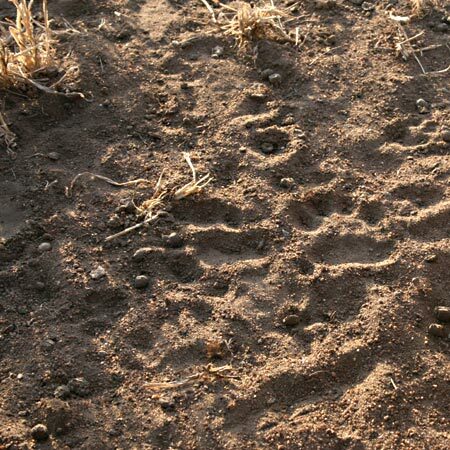 I think it is a leopard track. theres some thing there i cant make out………. is it a secretary bird???? hahahaha i give up!!! or i think i can make out a cheetah going from left to right???? there might even be one more in there??? I think it’s the footprint of a Lion! Looks round and no claw mark, 4 digits. So big cat. The main/middle pad does not have the depressions that seems typical of the lion. Complete guess, could it be a Hyena? I think its a Lion footprint.